Author Cassie Louis hopes to help, support, ‘heal souls’ of people living with HIV/AIDS. Five years ago, Cassie Louis contracted HIV, the virus that causes AIDS. Louis echoes the notion that the disease has been destroying so many lives, including hers. 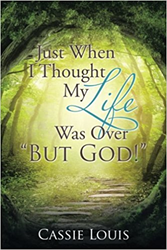 As a “long-term survivor,” she empathizes with the people who are still combating the sickness and wishes to reach out to them through “Just When I Thought My Life Was Over ‘But God!’” (published by Xlibris). In her book, she retells the “enduring times” when living with the disease was a struggle in every area of her life and within herself in every way. But positivity and her faith in God helped her overcome and “be free” from the illness. “I want to reach out to them by stating to them in words which is by my book that there is still life to live although they feel as if they have died within themselves,” says Louis. The book is simply a heart-to-heart talk between an “over comer” and the “still struggling,” in hopes to lighten the burden brought by the disease.